During the year 2012 we were fortunate to have darshan of SAPTHA BHADRI . Among the Seven Bhadris , Bhavishya bhadri darshan was most memorable . We drove by a hired cab upto Saldhar which is about 19 kms from Joshirmutt. The weather was pleasant and chilly and we were reminded of Tirumala ghat road.. An arc mentioned as Tapovan made our spirits engulf the serene atmosphere . This is a serene place for meditation. 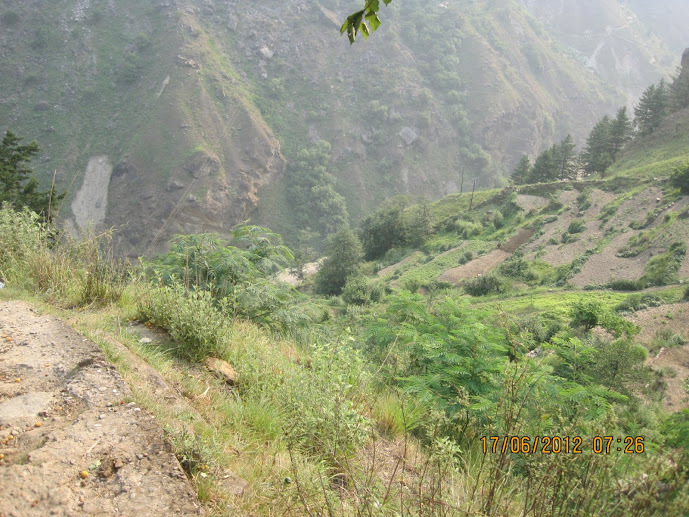 Driving ahead, we reached the starting point of our trekking. 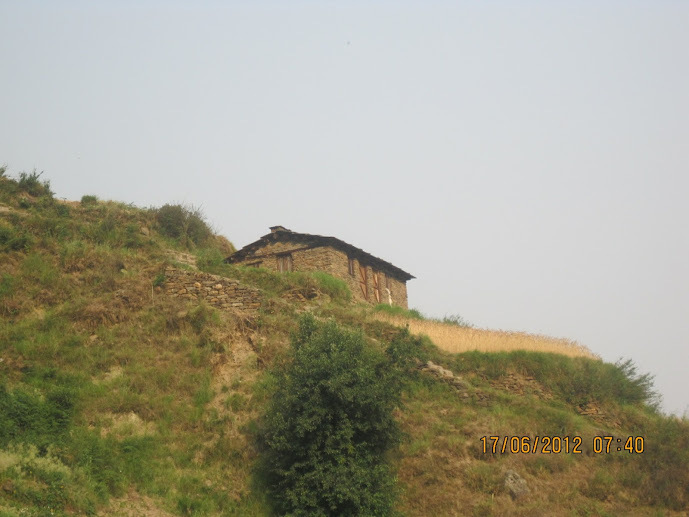 Bhavishya Badri is located in Subhain village and one has to trek the hill for 6 kms in a lonely path . We just found a small arch mentioning Bhavishya Badri. We were five and Adiyen was only male member trekking in in a lonely place. 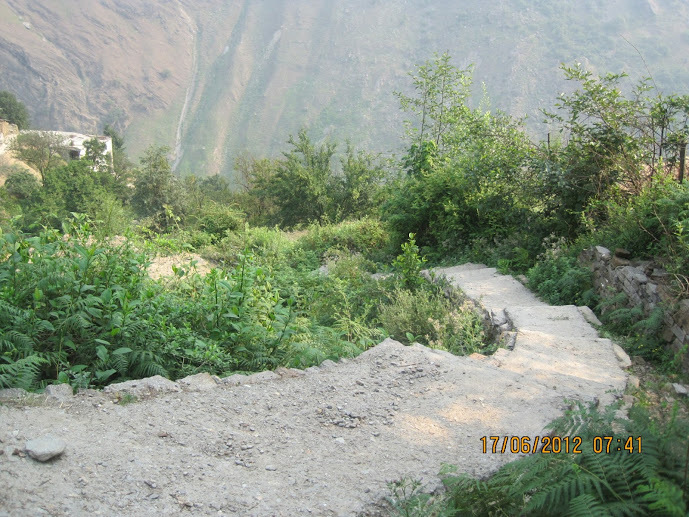 Initially there were few steep steps laid as a pathway for about a kilometer. Singing Annamacharyar keerthanas and chanting the mahamantram Thirumantram, we prayed LORD for HIS darshan in this lonely place and started trekking. There are no sign boards, no indication about the route . 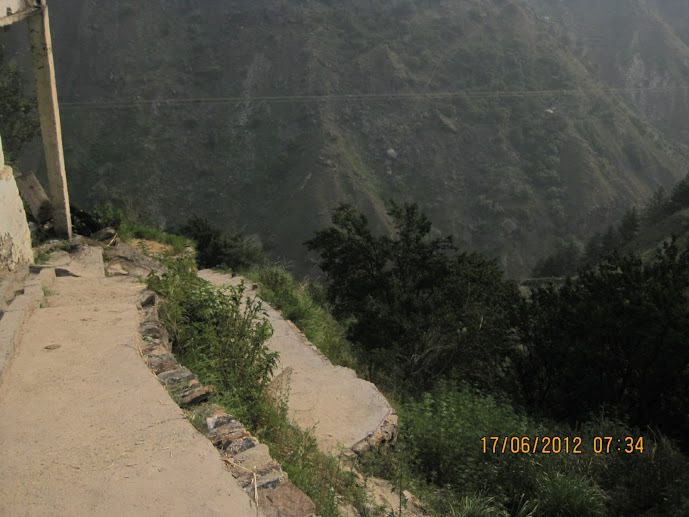 The Lord seated as Antharyaami was guiding us.. We didn’t even know whether the route taken by us was right or not. 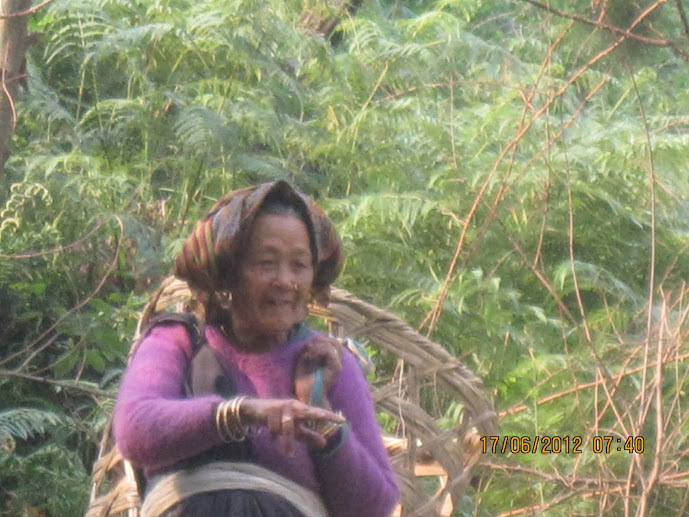 We were enthralled to see a villager from whom we inquired about the route. 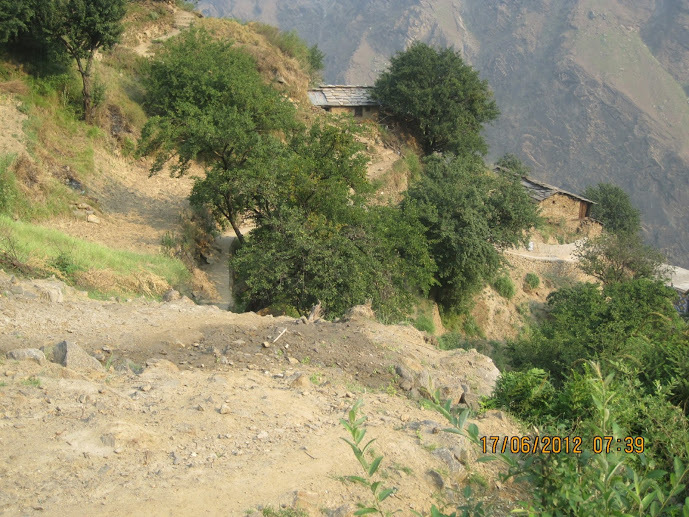 Felt delighted to note that we were on the correct path and as per his directions, we continued our way. Beyond the first settlement, there is no pathway at all. There was greenery everywhere and the different varieties of wild flowers which had blossomed were so colorful and pleasing to our eyes impelling the children to burst into some song. WE could see chameleons, colorful butterflies, squirrels , forest ants and humming sound of bees from far. 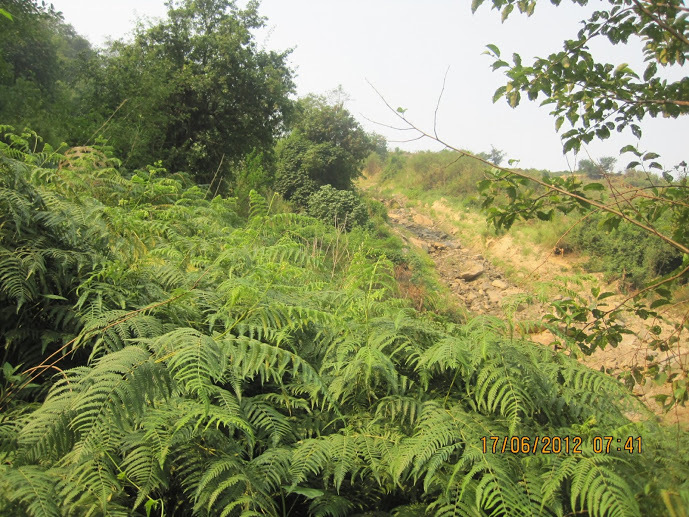 However, we realized that the forest shrubs and plants which were growing on either sides of this so called tiny footpath was hostile. The leaves were sharp and accidentally if our hands touched the leaves, that part in our hand which came in contact with the leaf would get swollen immediately. WE had to be cautious while trod ding the path so as to avoid stamping on some forest snail/snake/ant etc. The path is slippery and my daughter who made a wrong choice of wearing heels had to remove her slippers and walk bare footed all through the way. Of course all these didn’t matter because we were focused on our destination. Once in a while, when we came across some passerby , we used to take directions from him and proceed on our adventurous trip. As we are not used to altitudes, we trekked slowly taking occasional rests . Somehow we were all energetic singing the glories of the Lord and enjoying nature’s beauty. In lighter moments, cracking jokes on each other once in a while to ease out the stress, we kept on ascending the hill. While trekking so, we suddenly got confused as the so called footpath was leading to two ways and we didn’t know which one to take. My niece found a Lays wrapper and suggested that the path would be inhabited. Children were enjoying the adventure guessing the route,pulling each other….It was a real holiday for them. We were imagining as to how Thirumangai Azhwar would have reached Badri Vishal which would have been unexplored like this at that time. 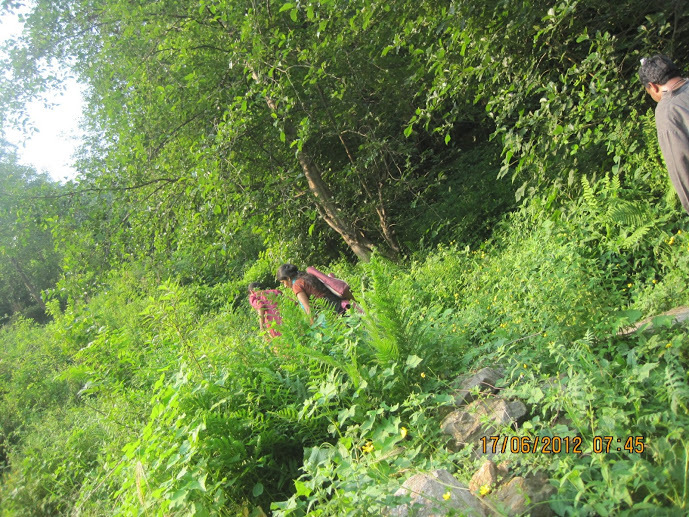 There was no one to inquire and we were getting nervous as to whether the path taken by us was right or not. After walking for about half an hour, we met a lady who said that the route taken by us was wrong and she volunteered to take us to the correct path. We felt that it was God in disguise who appeared to help us out. We were once again left to ourselves and continued with our journey. After trekking for about 2 hours, we were exhausted and were searching for a place to relax. Luckily, we found a shop on the way . As we wished to remain light while trekking, we didn’t have breakfast and now the children badly needed something to re-energise themselves. The shop provided all sorts of snacks, cool drinks , medicines, water etc. 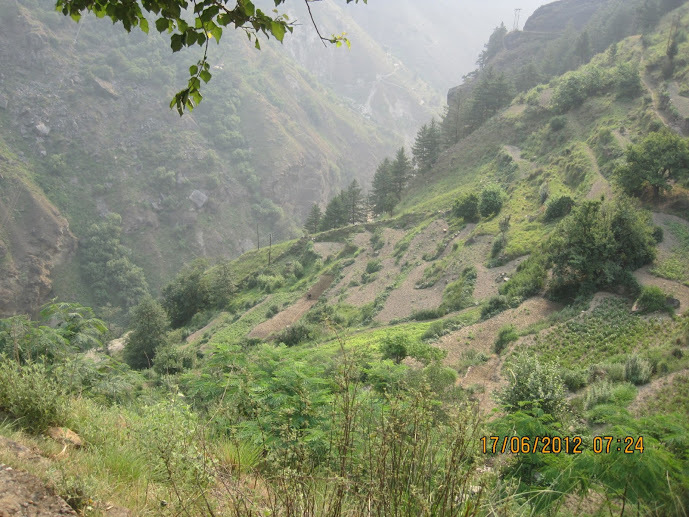 After replenishing ourselves, we continued onwards our 2 kms trek journey. This particular settlement was much better compared to other isolated places. 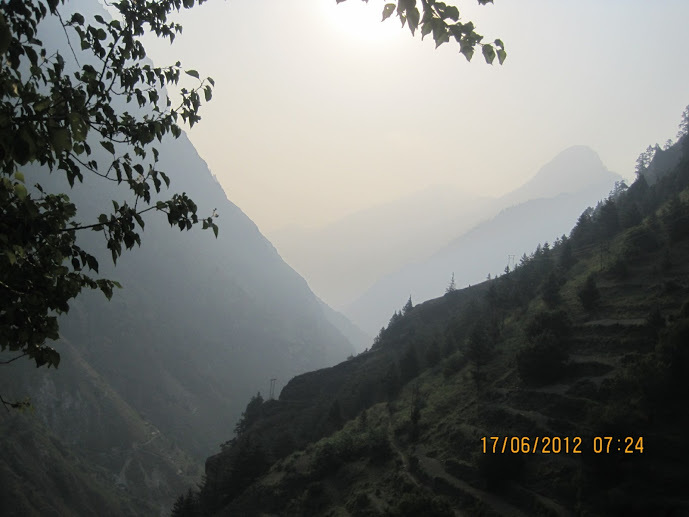 We continued trekking and once again left with no one around. WE could not locate any path way and didn’t know which side to take-left or right!! WE took the wrong path and after some time, we saw a person down the hill and screamed for help. He informed that he is the temple priest and he was also going to Bhavishya Badri. Our joy knew no bounds. He accompanied us for some time, and as we couldn’t cope up with his lightning speed, he gave us directions and left. He said that the temple was only one km away .WE were now on a bigger plain surface. Surrounded by snow clad high mountain peaks on all sides, sun rays falling through the tall eucalyptus trees and gentle breeze full of medicinal properties accompanied by Dhauli Ganga flowing as a small stream , green vegetation in the surrounding places and the sound of cuckoos as if welcoming us , we were in ecstasy looking at the marvelous creation of the Lord. We have seen this in movies but now we are here experiencing them with our own eyes but for deers and peacocks. 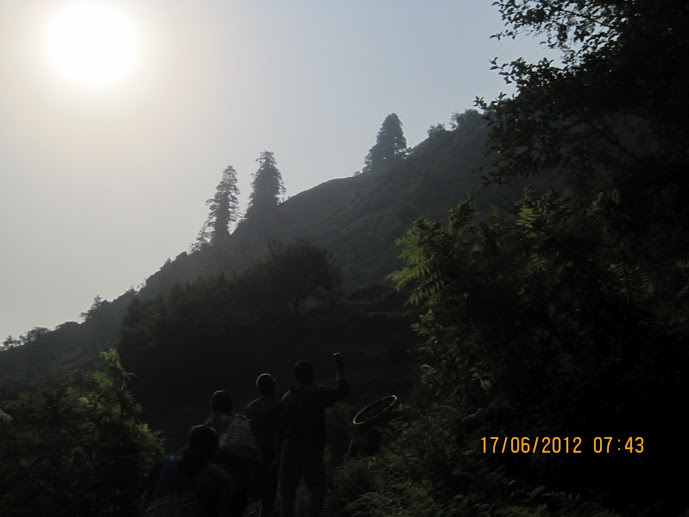 Even after trekking for hours, we were still energetic and bubbling with joy as we were near to our destination. Two local women farmers were passing by us suggested us to taste the crystal clear cold water from the Dhauli Ganga stream. Pure un adultered tasty water was like nectar. They accompanied us to the temple. We reached the temple past noon. AS the pujari met us on the way, he was waiting for us. 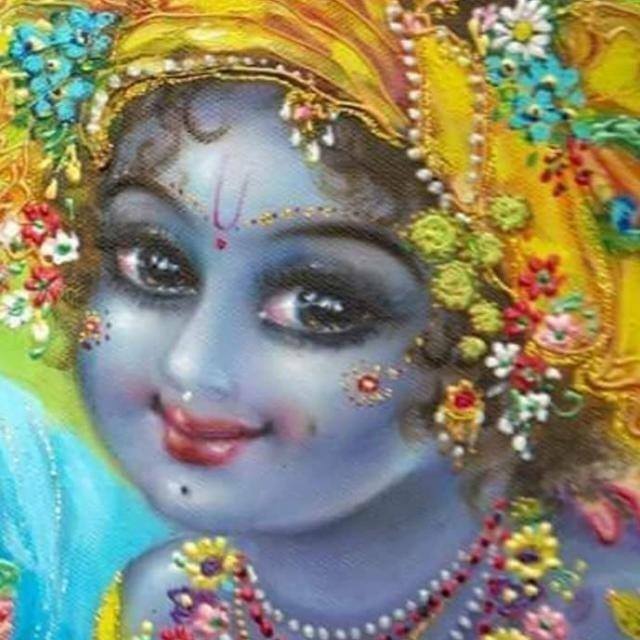 All of us had very good darshan of the Lord. The pujari explained to us that 10 years ago, there was only a sketch mark on the rock but now we can see the Lord’s figure emerging out of the cave. 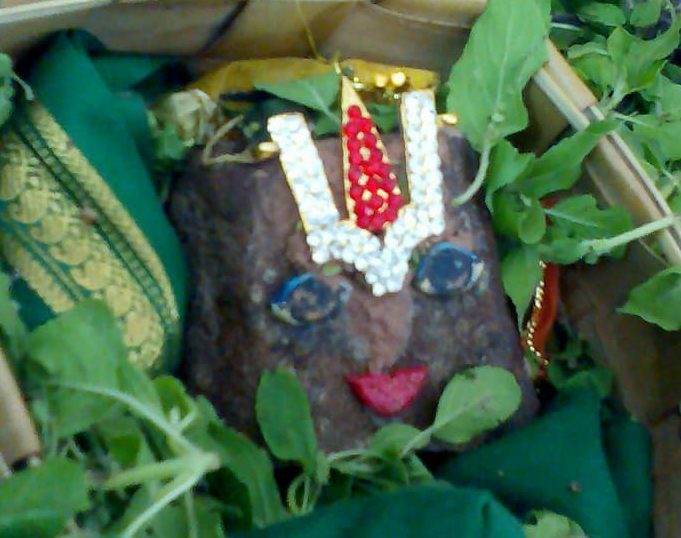 The Lord is in the form of Narasimha bhagavan. The pujari pointed us to the various features in the half emerged idol attributing its form to that of Lord Narasimha. How fortunate and blessed we are to have Lord Narasimhar as Bhavishya Badri Narayanan. In the present Badri Vishal, the Lord is in the form of Narayanan whereas here HE is going to assume the form of Bhakthavatsalan, Lord Narasimhar whose avataram is for the sake of devotee. JAI NARASING DEV!! WE offered our dry fruits to the deities and did kirtan for about half an hour. A mahamantra sticker is at the entrance which was pasted by ISKCON PAADAYATRA troup who visited this temple some time ago. WE were imagining that when Thirumangai Azhwar visited Badri Vishal few thousands of years ago, that place would have been similar to this one now.After trekking almost 6 KM for 4 hours reaching at an altitude of 3200 metres we are delighted to have darshan of Bhavishya Bhadrinathji.. We chanted Mahamantra . At 3200 m height we could see the local people also joining us to chant the HOLY NAME .It was a great feeling . Was immensely pleased to note from a sticker that ISKCON PADAYATRA devotees also visited this dhaam.